James Petrie was a baker by trade. He entered the trade as a young man and owned a bakery business in the Murraygate, Dundee for twenty five years. Subscriber 47 – John Cooper, Esq., corn merchant – successor to the business of James Petrie. 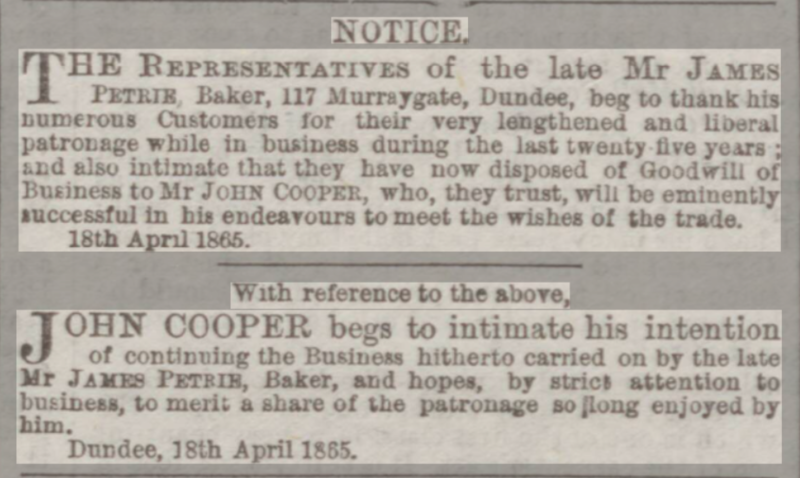 James Petrie set himself up as a baker in Dundee c.1840, with premises in the Murraygate. At the time, James would have been a young man of 21 years of age. He was admitted to the Baker Trade of Dundee on 25 February 1840, later becoming Boxmaster in 1853 and Deacon of the Trade in 1855. James Petrie was born on 8 November 1819, in the parish of Monikie and was baptised on the 14th November. His parents were George, then a weaver, (later becoming a baker and shopkeeper), and Helen Petrie. He also had an older sister, Margaret born in 1816. A younger brother, John, died in infancy. The 1841 census found James at 93 Murraygate, Dundee, where he professed himself as a baker. His older sister, Margaret, was living in the same household. It would appear that by 1850, until 1864, the year of his death, Petrie’s business premises were located at 117 Muraygate, and, at times, he employed as many as six people. James Petrie became a notable baker and it was under his careful guidance and supervision that Peter Anderson, born in 1831 in Arbirlot, began his apprenticeship and went on to become one of the most well-known of Dundee based bakers. James Petrie’s presence in Dundee signified more than his well-acknowledged reputation in the trade. He also was a well-respected member of the community and a philanthropist. However, this was not entirely the end of the Petrie connection with the Murraygate. Between the years 187-74, James Petrie’s nephew, James Petrie Mathers was a partner in ‘Mathers & Petrie,’ bakers, the other partner having been Charles Petrie (perhaps a relative). Their business operated from 105 Murraygate, while James and his mother, Margaret lived at 107 Murraygate. The short-lived co-partnery of ‘Mathers & Petrie’ was dissolved in February of 1874. Old Parish Registers. Monikie, Angus. Births. (1819). 30/311. ScotlandsPeople website. Census Records. Dundee. (1841). 282/ 18 7. ScotlandsPeople website. Dundee Directory, 1842-43. p.65. Dundee Central Library, Local Studies. Dundee Directory, 1853-54. p.201. Dundee Central Library, Local Studies. Valuation Rolls. Dundee. (1855). VR009800001-/31. ScotlandsPeople website. Statutory Registers. Dundee. Deaths. (1864). 282/1 1374. ScotlandsPeople website. Legal Records. Wills and Testaments. Dundee Sheriff Court. (1870). SC45/ 31/ 22. ScotlandsPeople website. Lockit Book. 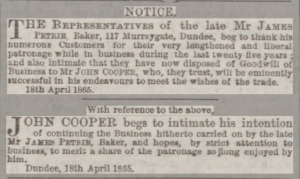 Baker Trade of Dundee. ref. GD/TD/B/1/2. Dundee City Archives. Census Records. Dundee. (1851). 282/ 15 16. ScotlandsPeople website. Census Records. Dundee. (1861). 282/1 4/3. ScotlandsPeople website. Dundee Directory, 1850. p.144. Dundee Central Library, Local Studies. Dundee People's Journal. 22 Apr 1865. British Newspaper Archive website. Dundee Courier. 27 February 1874. p.1. British Newspaper Archive website. Dundee Directory, 1871-72. p.157. Dundee Central Library, Local Studies. The information above about James Petrie has been collated from a range of digital and hard copy sources. To the best of our knowledge it is correct but if you are relying on any information from our website for the purpose of your own research we would advise you to follow up the sources to your own satisfaction. If you are aware of an inaccuracy in our text please do not hesitate to notify us through our Contact page.